On the World Cancer Day, it is relevant to remind that smoking and alcohol consumption are the main risk factors for oral cancer. 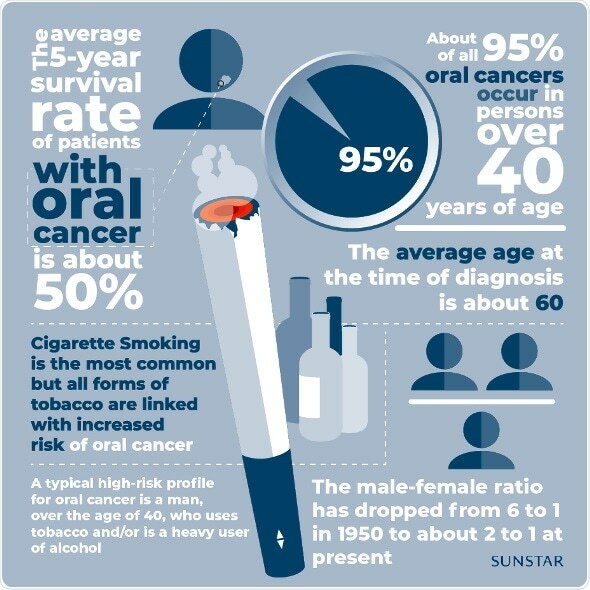 In fact, tobacco (smoking and smokeless such as chewing tobacco) causes 90% of oral cancers. On top of that, individuals who smoke and drink have a 35-fold increase in developing this condition. "About 500,000 new cases of oral and oropharyngeal cancers are diagnosed annually, three-quarters of which occur in the developing world,” said Dr Ihsane Ben Yahya, FDI Council member and oral cancer expert. Consequently, encouraging the dental professionals to conduct oral screenings for early detection of this disease as well as helping them to work together for better management are the main priorities of the chairside guide launched by the FDI and SUNSTAR. This toolkit for professionals focuses on the prevention and management of oral cancer patients, paying particular attention to the screening process. The chairside guide provides oral health professionals with concise, yet comprehensive, information about oral cancer prevention, risk factors and management, and also helps them navigate the clinical examination and diagnosis through a decision tree. The holistic healthcare company has been contributing to research and raising awareness about the two-way relationship between oral health and general health for many years now. Under #ThePerioLink project, SUNSTAR gives visibility to the many impacts of poor oral health, spanning from diabetes to sports performance, and encourages the population to take care of themselves holistically.